Yoenis Cespedes sits again, and Mike Scioscia still doesn’t like the Home Run Derby. As good as the Angels’ pitching has been in the first two games of their series against the Oakland A’s, it’s been hard to ignore the big piece missing from the middle of the A’s lineup. Yoenis Cespedes is dealing with a sore left wrist that will sideline him for a third consecutive game today. Manager Bob Melvin has said he doesn’t believe the injury is related to Cespedes taking part in — and handily winning — the Home Run Derby on Monday in New York. Regardless, Cespedes’ absence certainly won’t improve Angels manager Mike Scioscia‘s opinion of the derby — at least, the toll it takes on hitters. Mike Trout (right) was chosen an American League All-Star in 2012 despite not making his debut until April 28. 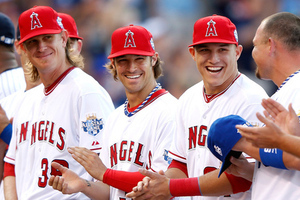 Yet when All-Star game voting opened a year ago, on April 20, 2012, Mike Trout was in Triple-A. His first game of the season was eight days away. Ten days into the balloting, on May 1, Trout was batting .091. By June 1, he had five home runs and the pacesetter, Oakland A’s outfielder Josh Reddick, had 14. So you wonder if Bruce Bochy would have wanted Trout, if by some strange reason the San Francisco Giants manager was in charge of the American League squad. Bochy explained his theory in a radio interview earlier today when asked about Yasiel Puig, the Dodgers outfielder who is putting up Trout-like numbers (better than that, even) through his first 13 major-league games.